At Coalition Technologies, we have an awesome group of people working everyday to make us one of the best SEO and web design companies in Los Angeles. Every month, we like to highlight two of those amazing people who we feel are really vital to our daily operations. In November, Kelsey and Czarina really stood out as exemplary team members. Read on to learn more about what makes Czarina and Kelsey ideal Coalition employees. Kelsey started working at Coalition Technologies in October of 2017 as an Office Assistant. In a few shorts months, she has proven to be a indispensable member of our team. Her hard work is noticed daily by her peers in our Culver City office. She has taken on the challenging role of managing Accounts Receivable and payment collections. Finding pride in every payment that is made through her efforts, Kelsey excels in her role and wears many hats to ensure that our office runs smoothly. From feeding the staff to explaining health insurance in depth, she handles the diversity of her job with ease. Kelsey enjoys the cultural diversity that working with Coalition Technologies offers. She loves meeting new people from all lifestyles and backgrounds. She also delights in Coalition’s close-knit working environment where the team members and listen and care about one another. In her spare time, Kelsey prefers to spend time with her cat, affectionately dubbed “Garbage”, and diving into the world of DIY. The head of Digital Strategy Assistants, Czarina began working at Coalition Technologies in February of 2014. A longstanding part of the Coalition team, her leadership qualities and ability to adapt have made her a integral part of daily operations. Her ability to balance tasks and learn as she goes is something all of her peers admire. Every day, Czarina spends her time updating and following up on old leads, auditing leads, creating Basecamp assignments, and a slew of other tasks. She trains all new Digital Strategy Assistants and makes sure that Romy training is up to date with new processes for her team. Starting out with little technical knowledge, her abilities and responsibilities have grown as quickly as her knowledge over the past 4 years. When Czarina first started with Coalition, she remembers being part of a small team and struggling to learn and keep up with the fast paced environment. However, she buckled down and dedicated herself to becoming the best Digital Strategy Assistant and achieved an “outstanding” KPI just three months after starting her job – no easy feat! In her spare time, Czarina enjoys going to the beach, binge watching movies, and gardening. She has also lived in several different countries including India and Italy. 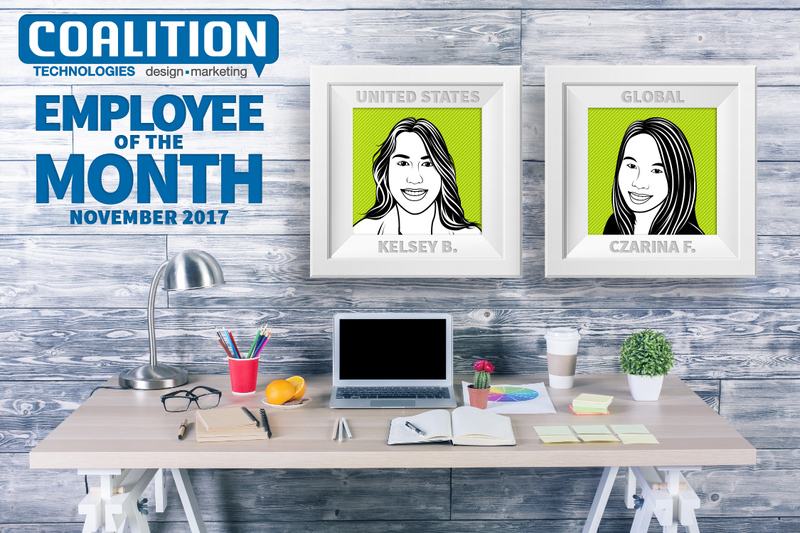 Coalition Technologies is a thriving company because of the hard work by team members like Kelsey and Czarina. Without having people like them as our backbone, we would not see as many successes as we do. 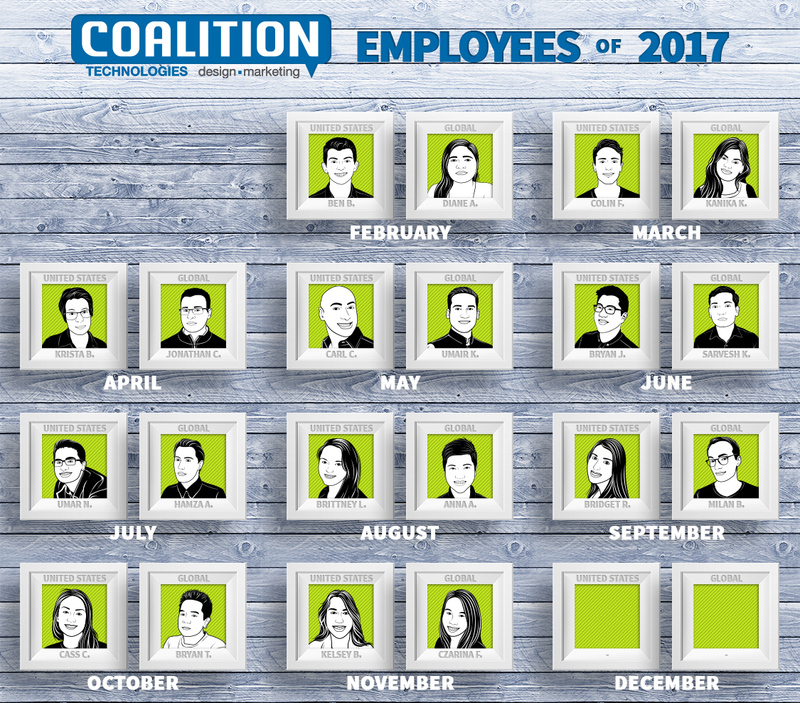 Keep a lookout for December’s employees of the month and get to know more about those who are working behind the scenes at Coalition.